January 31 2019, 5:32 p.m. Someone is arrested in the United States every three seconds. While arrests are the first entryway into a criminal justice system most acknowledge is in dire need of reform, we know remarkably little about who is arrested, where, and why. Advocates and legislators have pushed in recent years for policy changes at various points of the justice process, from pretrial to sentencing, but arrests remain one of the largest and least scrutinized contributors to the country’s mass incarceration and policing crises. The FBI and Bureau of Justice Statistics collect arrest data from the country’s 18,000 law enforcement agencies — but those agencies self-report on a voluntary basis, and there are significant disparities in the information they share. The data, for the most part, remains inaccessible to the broader public, and statistics on crime are isolated from data about the effectiveness of enforcement. 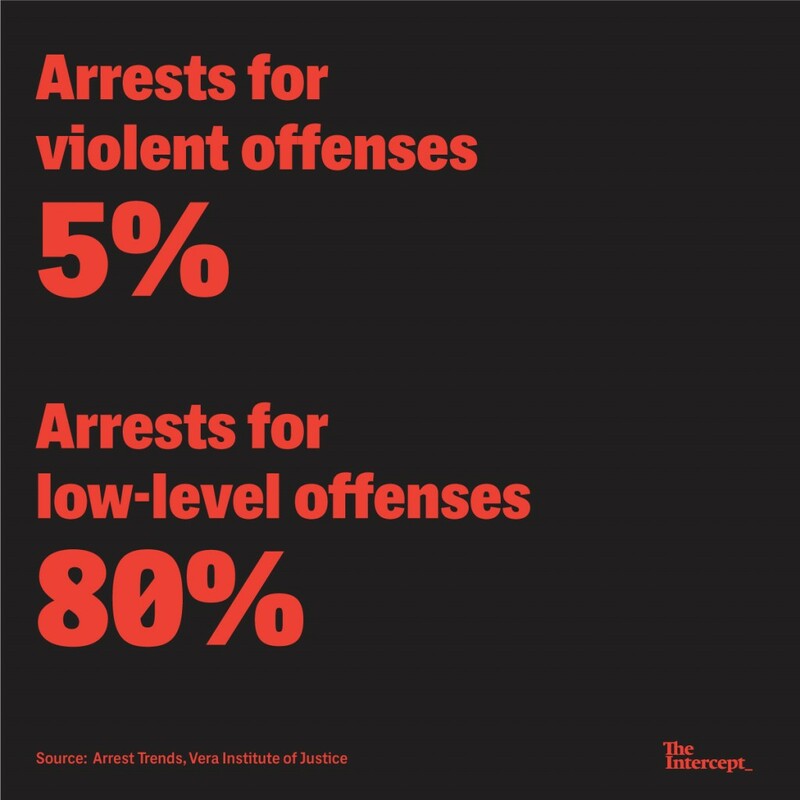 In an effort to better inform conversations about criminal justice, a team of researchers from the Vera Institute of Justice, a nonprofit research and policy organization, took more than two years to combine eight different federal databases into a tool that allows users to analyze arrest trends at the national, state, and county levels against a series of variables, including offense types, demographic factors, and solved crimes. That data shows that of more than 10.5 million arrests made every year, the bulk are for noncriminal behavior, drug violations, and low-level offenses. Since 1980, arrests for drug violations have increased by 170 percent, and racial disparities in enforcement have grown even more stark. Still, a majority of victims don’t report their experiences to police, and police solve only a fraction of the crimes that are reported. In recent years, after a series of police killings sparked nationwide protests, a growing movement for police accountability also exposed systemic problems with everyday policing practices. 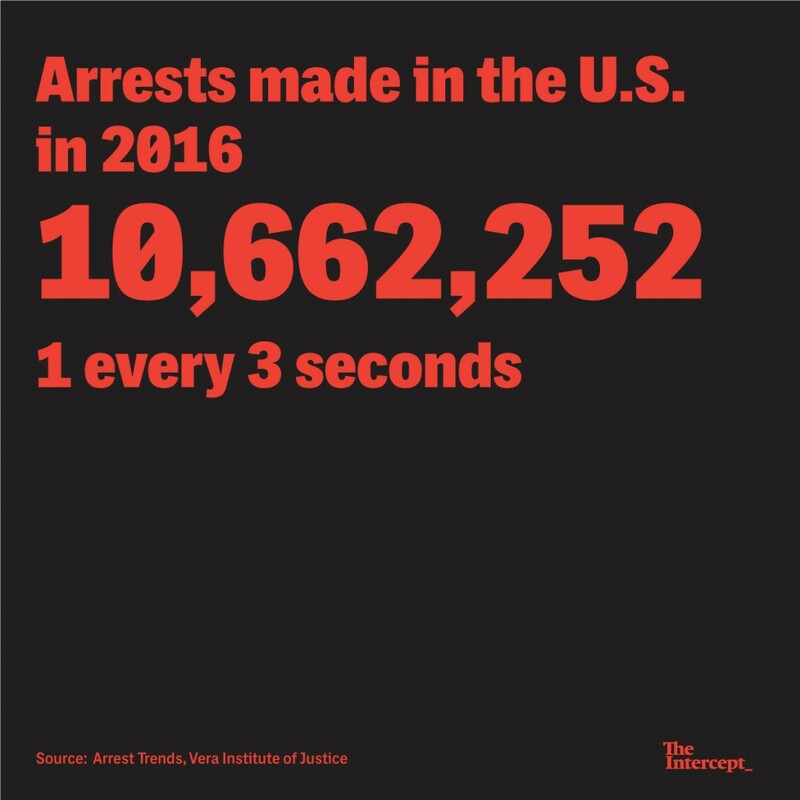 Most arrests are ultimately dismissed, but aggressive enforcement of low-level offenses, especially in communities of color, causes long-term damage to those communities and their relationship with police. The Vera tool analyzes arrest trends between 1980 and 2016. The data shows that overall arrests have declined by nearly 25 percent over the last decade. But it also shows that, while arrests for serious crimes have dropped consistent with declining crime rates nationwide, they are increasingly being substituted with arrests for minor misconduct. Among the most common causes for arrest are low-level offenses like “disorderly conduct” and a broad, largely unexplained category the FBI refers to as “all other offenses,” which can include a variety of non-traffic offenses, violations of local ordinances, and civil violations like failure to pay fines or child support. Together with drug violations, these offenses account for more than 80 percent of arrests, while serious, violent offenses make up less than 5 percent of arrests. While there is little integration between court data and police data, and it’s hard to track a case from arrest through prosecution, a majority of arrests are dismissed. Still, police continue to use them as an enforcement tool of their own, rather than a way to funnel criminal behavior into the justice system. What the FBI refers to as “drug abuse violations” lead to 1.5 million arrests annually, the Vera report found. And while the FBI doesn’t differentiate in how it categorizes drug violations, federal statistics have consistently shown that a vast majority of them are over simple possession, most often of marijuana. The report also highlights the vast racial disparities in arrest rates, particularly when it comes to drug enforcement — and even in places where drug enforcement policies have been loosened. “In just about every state that’s made changes to how laws around marijuana are enforced, we see major racial disparities in enforcement,” Neusteter said. Black people nationwide are an estimated 2.39 times more likely to be arrested for “drug abuse violations” than white people — even though drug use rates are similar across the two groups. The estimated number of arrests of black people across the country has risen by 23 percent in the last four decades. African-Americans now make up 12 percent of the U.S. population and an estimated 28 percent of all arrests. Amid a push for more progressive polices in prosecutors’ offices, a growing number of district attorneys have announced that they will no longer prosecute marijuana possession. But that hasn’t necessarily translated into a drop in arrests yet. Perhaps the report’s most revealing finding, however, is that such aggressive enforcement doesn’t seem to do much to improve public safety or solve crime. Only 40 percent of crime victims report their experiences to police, Vera found, and fewer than 25 percent of reported crimes are cleared by arrests. Arrests have an enormous impact on individuals: They can exacerbate economic disparities, harm an individual’s capacity to retain housing and jobs, and lead to devastating consequences like the loss of child custody or deportation. The mental health cost, too, is significant. But the huge number of arrests also comes at a cost to the safety of the community at large: both at the moment of the arrest itself, which can put those arrested, bystanders, and officers at risk of harm, and in the long run, as relationships between over-policed communities and law enforcement deteriorate, sometimes irreparably. While that seems far too high a price, police continue to focus their attention on the enforcement of low-level offenses and noncriminal behavior, reinforcing a cycle of mistrust. That’s in part in response to arrest quotas and other incentives police get for productivity, as well as financial gains for agencies and municipalities that rely on punitive enforcement for funding. Vitale pointed to the controversial “collars for dollars” practice, by which officers will sometimes make arrests toward the end of their shifts in order to earn overtime pay, as they are required to remain with the person they arrested through the booking process. “A marijuana possession arrest at the end of the shift can be worth several hundred dollars for the officer,” he noted. There are some bright sides to the Vera report, which the authors hope will inspire further analysis and reform. Arrests of minors, for instance, decreased by more than 50 percent between 1980 and 2014, as juvenile-specific offenses like running away or curfew violations were decriminalized, and non-punitive programs were instituted in lieu of arrest. The solution, the report makes clear, is to find alternatives to enforcement for much of the behavior police currently address with arrest.